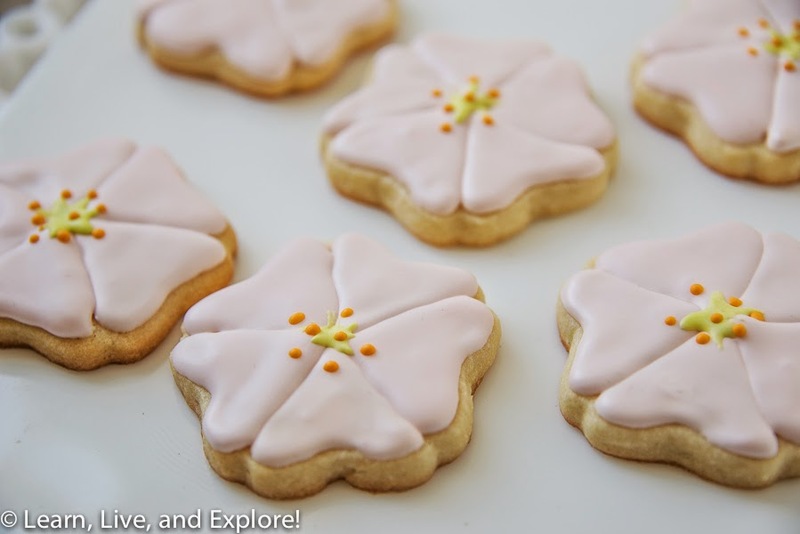 Cherry Blossom Cookies ~ Learn, Live, and Explore! Last year, my friend traveled to Japan and brought me back an adorable set of cherry blossom cookie cutters. 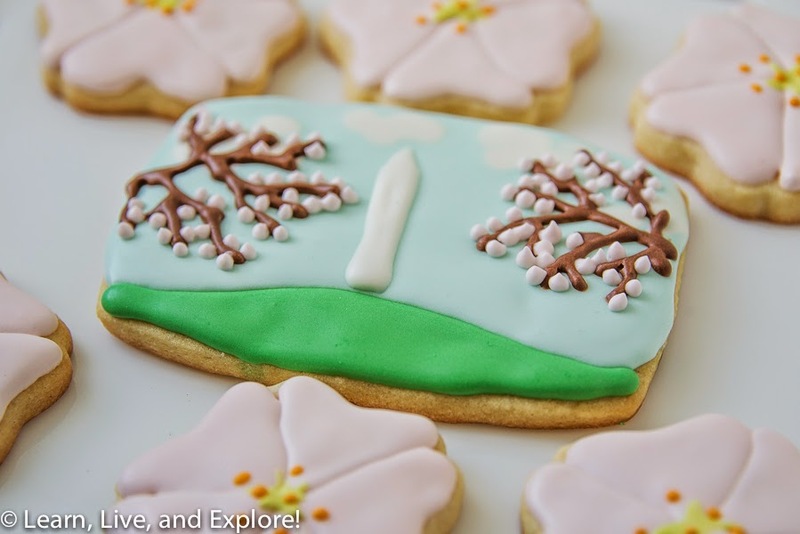 We've been working together to build up both of our cookie decorating skills, and it's the beginning of cherry blossom season here in Washington, D.C. so what better time to try out these cookie cutters! There are several versions of cherry blossoms, but the ones along the tidal basin in D.C. are the palest of pinks with these fantastic sometimes mauve, sometimes lime green pistil in the center. We flooded the petals by making individual heart shapes and letting them dry enough to maintain the distinguishing lines before making an adjacent heart shape. Once the pink flooded areas were dry, we hand painted the green pistil and the yellow stamen with toothpicks, dragging the green out from the center. The pink is Americolor's Soft Pink and, to keep it pale, I squeezed some coloring onto a plate and used a toothpick to slowly add the color into the white royal icing - a little went a long way. The green is Americolor Electric Green and the yellow is Americolor Egg Yellow. 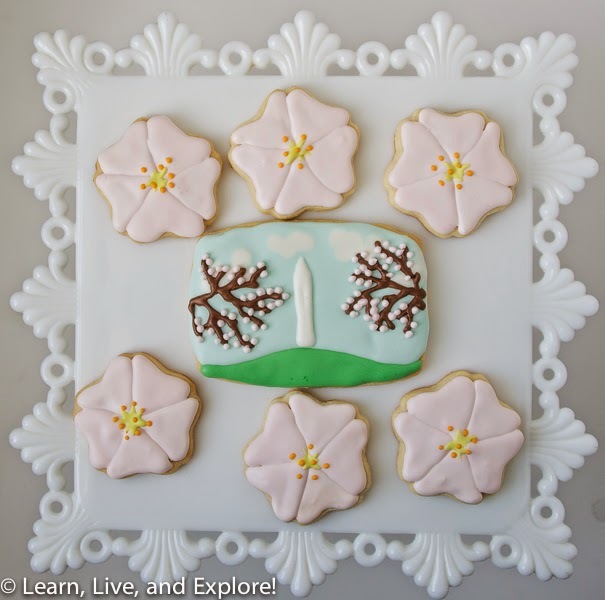 Of course I didn't want to limit my decorating to the flowers, so we made a few rectangle shaped classic "tourist shot" of the Washington Monument framed by cherry blossom trees as well. 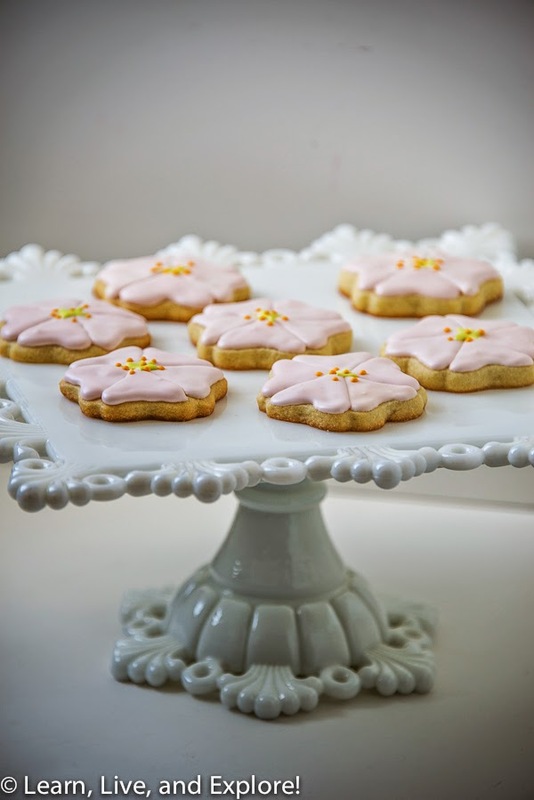 I love how great the cookies look on my antique milk class cake stand, don't you? Yea for Etsy's wide variety of beautiful things!